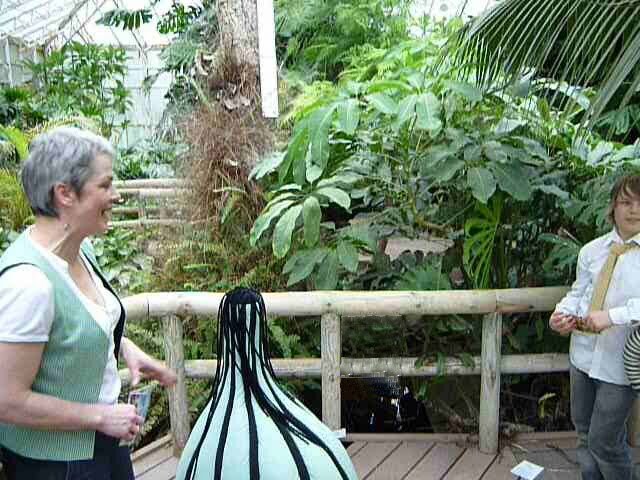 The Sir Joseph Banks Conservatory in Lincoln… would I like to exhibit there? Yes of course! The show was called, Meleager’s Garland and it was curated by Anneka French and Rebecca Wombell and took place over the last May Bank Holiday weekend. The name was inspired by the Greek poet Meleager who first assembled an ‘anthology’ of poetry, titled The Garland. The word ‘anthology’ was previously only used to describe collections of plants. 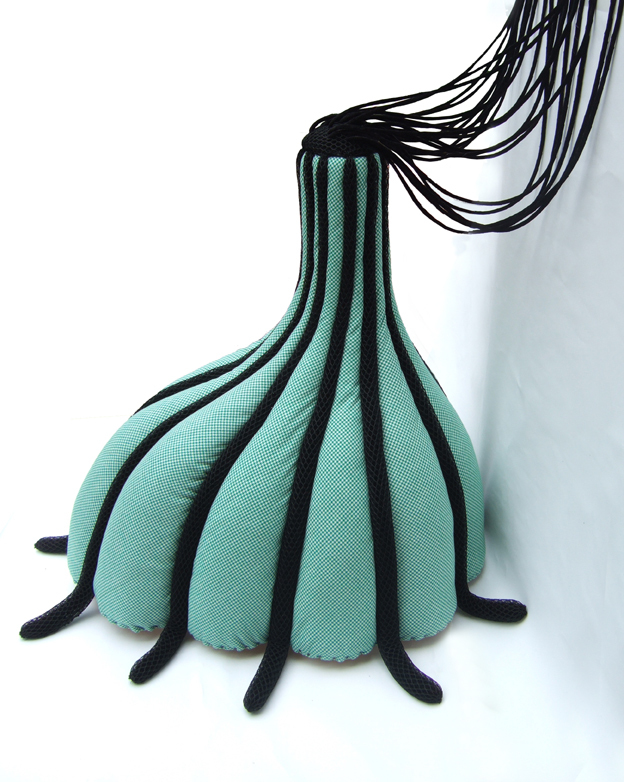 The artist call out mentioned that the curators were looking for artists … “working with ideas related to botany, artificiality and wider issues of ecology and the natural world”. In truth I draw most of my inspiration from architecture and costume; however, I was exceedingly interested in this non gallery space. I felt confident that "Madeleine" and "Cyril" would look at home in a glasshouse full of tropical specimens and so made some Photoshop images of them in hot house settings to help Anneka visualise this too. Right from the start I was interested not only in the venue but also in its connections with the 18th century. My interest in 18th century started when I researched Sir John Soane (the “grandfather” of British collectors) when I was writing my degree dissertation. The Sir Joseph Banks conservatory is full of specimens of plants which Banks collected on his travels. He rose to fame after travelling with Captain Cook on his first voyage to the South Pacific in 1768. Sir Joseph Banks was one of the most influential men of his time, advising King George the third and being a key figure in setting up Kew Gardens and also the development of Australia as a colony. I am interested in collectors and I am interested in stories and so Sir Joseph Banks is definitely of interest to me! When Anneka French came to my studio to meet "Madeleine" and "Cyril" in the flesh she asked whether they had any story linking them and I was enthusiastic to have the excuse to spend a little time fantasising about what relationship they might possibly have. It is not always good to be too specific about my thoughts on the beings and their possible personality traits, but for this event I gave myself the green light. By writing a set of 6 postcards between Madeleine and Cyril I was able to weave a gentle story which touches on travel, discovery, botany, history and of course alludes to the beings’ personalities and possible relationship. I plundered my collection of postcards and selected some that my grandmother had sent me. Most were from 1970. I think I was drawn to these especially because of their kitchness. You don’t get postcards with cardigans like this anymore! The two friends who helped with the handwriting were chosen as I felt that the style of their hand writing reflected the personalities that I wanted to suggest. Complete sets of the 6 postcards are available to buy for £2. Postage is FREE! Sir Joseph Banks played a huge role in raising the profile of botany. He also corresponded with many influential thinkers of his time. I was delighted to discover that he corresponded with Erasmus Darwin (Charles Darwin’s grandfather) as more of my Frillip Moolog beings will be occupying various rooms within The Erasmus Darwin House in Lichfield later this summer. This will give me another opportunity to develop another postcard narrative. Artists who took part in Meleager’s Garland were myself (Kirsty E Smith), Claire Brewster, Helen Snell, Andrew Bracey, Alexis Rego, Alex pearl, Liam Herne, Julia Hembrow and Stan Lenartowicz, Pamina Stewart, Richard Thornton, Sarah Nicholson, Rebecca Wombell, Zoe Maxwell, Kyle Kirkpatrick, Ruth Pigott, James Wilkinson and Katrina Naiomi. The exhibition artwork was by George Hardy. When deciding on the placing of each artwork Anneka and Rebecca made full use of the wonderfully atmospheric conservatory. Helen Snell’s tree boats were perfect sailing amongst the coy carp. Some of them absolutely HUGE monster sized fish! They are in fact a species called Fish Zilla; the world's largest type of Koi. Claire Brewster’s paper cut birds (cut from old maps) were perfect placed within the foliage of this "Paper Flower" Bougainvillea. 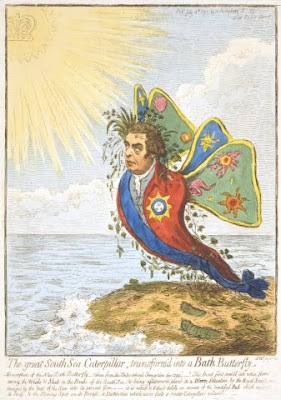 Andrew Bracey’s statement referred to this cartoon of Sir Joseph Banks as the Bath Butterfly (This drawn when he was awarded the Order of the Bath 1795). His piece, “Kaleidoscope”, comprised of a swarm of paper butterflies flying within a clearing in the conservatory. Each was made from folded pages which he had salvaged from old art magazines. I felt like an explorer trying to identify the artworks within these butterflies. 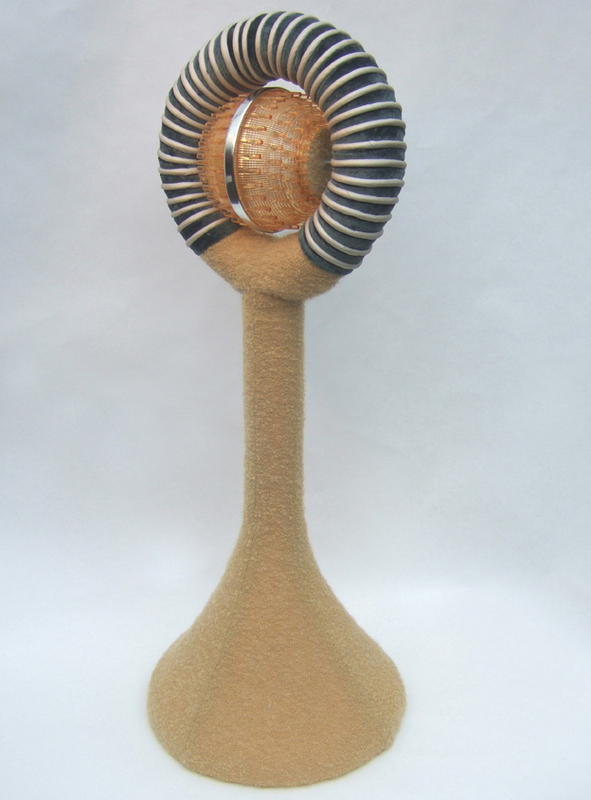 This is my favourite image of “Philosopher”, one of Alexis Rego’s pieces. I love the way that the reflections play with our perception of how an object inhabits a space. The effect of an artwork on our senses and emotions is not only in its physical presence but also in the way that it responds to the surrounding space. It also reminded me of how, as humans, we have to look hard to make sense of previously unseen forms. Our brains are programmed to try to make sense of forms and we do this using our previous experiences and understanding of the world. I love ambiguous forms! Alexis was confused as he thought that the form of "Madeleine" suggested a male character rather than a female character but he was using his previous knowledge of botany and plant forms. Little did he know that when deciding on Madeleine’s form I was inspired by 1950's Paul Warma Paraffin heaters and women’s corsetry! As part of the Evening Event on 30th May Dominic and I acted as "Madeleine" and "Cyril’s" voice pieces; i.e. we read out the postcards on their behalf. For this tentative foray into performance I made myself a waistcoat from remnants of Madeleine’s green dog-tooth check fabric and Dominic wore a tie that I made from the remaining vintage beige boucle fabric that Cyril is made in. Being part of a curated group show was a great experience; it was good to see how my work fitted in with the other works selected by Anneka and Rebecca, it was a very interesting non gallery space and it gave me an opportunity to try my narrative through postcards idea. 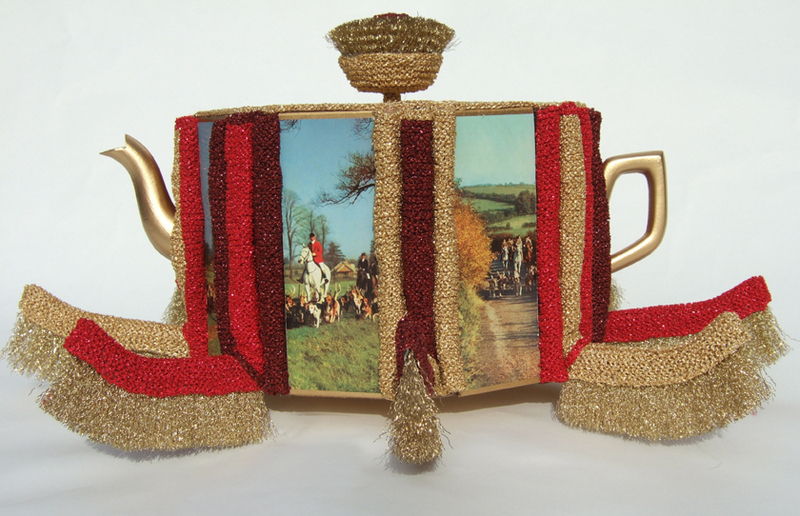 Finally it links beautifully to my next show which takes place in the Erasmus Darwin House in Lichfield this August. Erasmus Darwin was the linchpin of The Lunar Men… but that is for another blog post.